Posting pics of hardening finish is a practice best avoided (see "watching paint dry"), but that is what is happening in the shop right now. The shellac has been put on, left to dry, flattened and final polishing is under way. Meanwhile I'm making stringholders for the cover plates. 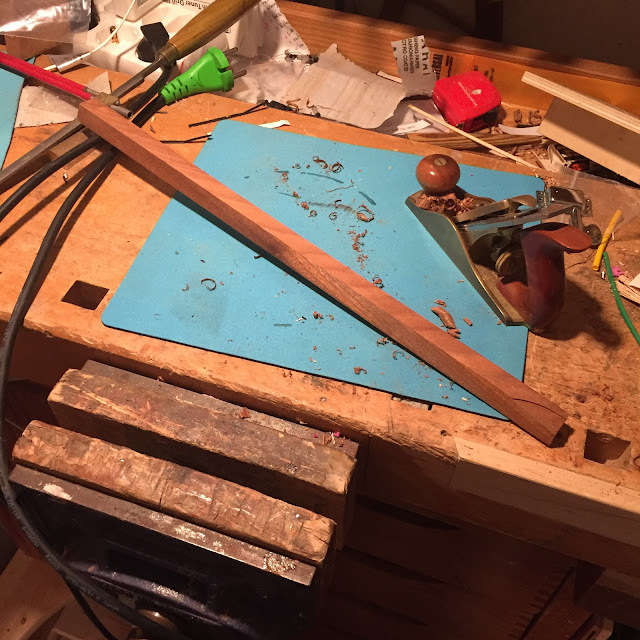 I chose a piece of mahogany (or possibly that other wood, sapele) and ripped a long piece on the small table saw. This will be enough for all six of them. 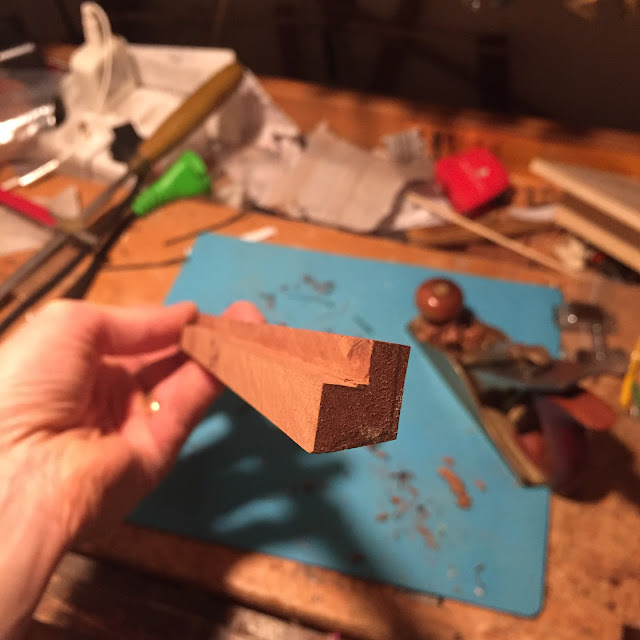 The rabbet for the knots and the slope at the front edge were also made on the saw and cleaned up with small planes. The wood has a quite lively grain but planes nicely, getting a very smooth and hard surface. Not much left now. No deliveries before christmas but early next year. Super short post, but I want you to know I'm alive. 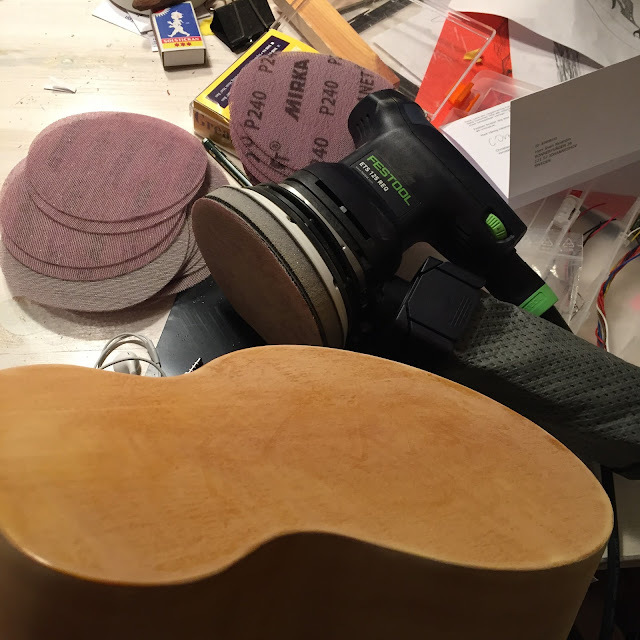 My Festool sander got here and I've started to flatten the shellac finish on the seven ukes. I bit the bullet and bought a new random orbital sander. 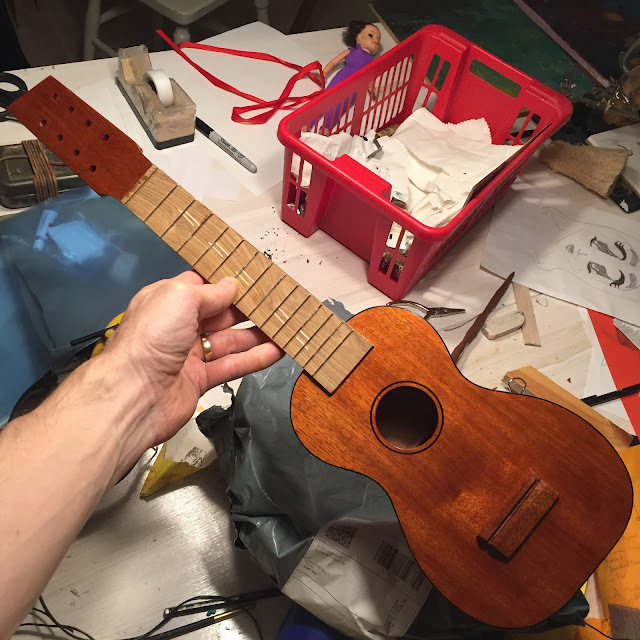 The idea of sanding the finish on these seven ukes was too much to bear so I ordered it earlier this week. But DHL tried to deliver it at noon on Friday so naturally I missed it. I'll try to change delivery address to the office. So, this weekend won't go down in history as the great flattening and polishing weekend. Instead it might go down as the not so great bass restoration weekend. 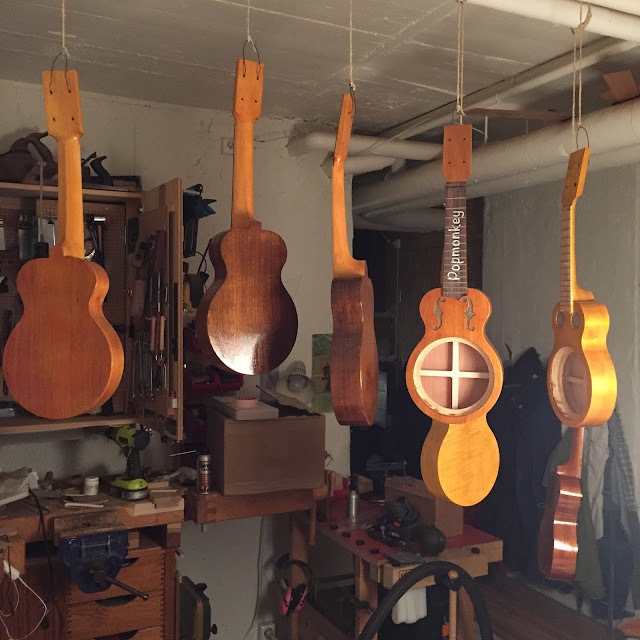 But first let me show you some ukes. Argapa 100, destined to be the odd child of every schoolyard it dares to tread. A taropatch soprano, who'd've thunk it? I'm rather pleased with the fret markers as I'm sure you are as well. Double strings slightly out of sync. And here they all are, with a rather heavy coat of shellac. I slathered it on with a brush so more a spirit varnish than polishing this time. You get why I need that sander. But the sander isn't here so I turned to my short scale Teisco bass. I will swap tuners, electronics and the pickup. I already did a re-fret job and made a new pick guard. And changed the bridge. So it's not much left of the original (it was already heavily altered when I bought it). 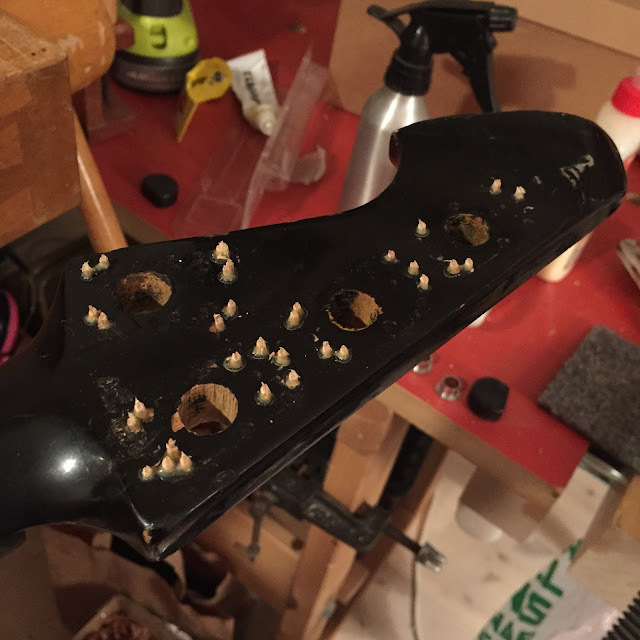 Here's the back of the headstock. I filled some screw holes. 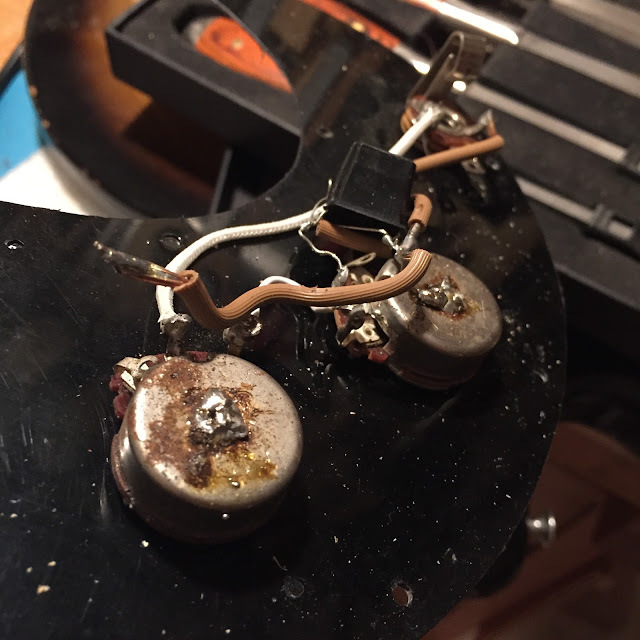 And I read in Dan Erlewine's book on guitar repair: "... guitar electronics is one area of repair where a novice usually doesn't do much damage." Those are good news since I'm a bit of an amateur when it comes to soldering and stuff, but look at the state of it now. It can't get any worse.